It’s about time I gave my opinion on a number of films I’ve watched a while ago. I didn’t have the time for that yet. Or was it just because I didn’t feel like writing about them? It’s not because they were aweful and totally crap. Far from. But quite simply because they were already extensively praised by other movie buffs. So here it is. A short and modest opinion. 1864. The civil war between North and South is intense and nearing its end. Will (Ashton Sanders) and Marcus (Keston John) try to earn some money during their miserable existence as a slave and serve as bait for the bounty hunter Burell (Bill Oberst Jr.). By using their directions, Burell captures escaped slaves and they receive a small portion of the premium. Strange but true. I didn’t know oppressed slaves were misused like this. Their survival instinct drives them to do such insidious practices and thus betray their own fellow-sufferers. They seek the company of those white bounty hunters, so they are safe for other white men. A contradictory situation. On the one hand there’s this sense of security. But then they are still under the rule of ruthless bounty hunters, who have no human feeling whatsoever for black people who they see as inferior. Will’s life basically revolves solely around treason. Treachery towards his own people and treachery also towards himself. Deep down he feels resentment and remorse about the fact that he’s forced to chase poor women and children into the hands of these bounty hunters. The ultimate task Burell asks them to do, is a search for the runaway slave Nate (Tishuan Scott) who buries fallen soldiers in the north. The reward probably will be sufficient enough to buy back their freedom. They just need to convince Nate to return with them. To accomplish that they use the excuse of a dying brother who wants to see Nate one more time. The feeling of guilt that’s bothering Will, grows even stronger because of the bond of trust that grows in between him and Nate. The lack of a father figure in his young life begins to weigh and Will starts to look up at Nate. When both of them save each other’s lives during the trip, Will’s resistance against the original plan begins to rise. He’s forced to take a well-defined hard decision. 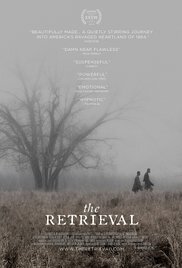 “The Retrieval” is, just like the movie “Django Unchained“, an attempt to show the life of an African-American from a completely different angle. Django was a free Afro-American. An individual who had the same rights as his white oppressor. In the eyes of these white masters this was unacceptable and hard to accept. Here, African Americans are forced to commit terrible acts. And they committed these acts merely to safeguard their own lives in these tragic and disgraceful times. Unfortunately, there is an oversupply of genres in this film. It’s a war movie (with brief excerpts from the battlefield), a drama about slavery, a kind of road movie and finally a coming of age story. All these genres together make that the movie can go in any direction. The interaction between Will and Nate is the most interesting portion of the film. A masterly combination of poignant conversations. Maybe this unvarnished version without stunning backgrounds and colorful images shows a more realistic view than the bigger Hollywood productions. The barren winter landscape with its gray, pale colors underline the human sorrow and melancholy tone of the story. Perhaps the pace is a bit too slow, but this is compensated by the dynamic between the taciturn old slave and the with doubts haunted young boy. Perhaps “The Retrieval” is technically inferior compared to “12 Years a Slave“, but content wise it’s maybe stronger.